The project involves the rehabilitation of the Upper Childs River to create a “cold water fishery” to re-establish brook trout in the river. We also intend to restore the abandoned Farley Cranberry Bog to wetlands habitat for waterfowl and wildlife. 1. The approval of the Conservation Restriction on the Farley Bog parcel by the Falmouth Conservation Commission, the Falmouth Board of Selectmen and the MA Executive Office of Energy and Environmental Affairs. 2. Closing on the Farley Bog parcel. The Town of Falmouth signed a Quit Claim Deed which was recorded at the Barnstable County Registrar of Deeds along with the approved Conservation Restriction. This transfer of title to the Farley Bog parcel was the final condition imposed by the CPC to make available the $150,000 of CPA funds approved by the CPC and Town Meeting. 3. The project team applied to the Mashpee CPC for a $240,510 award for restoration of the Garner Bogs in Mashpee, a key part of the project. The Mashpee CPC approved the application and it will be submitted to the Mashpee Spring Town Meeting in May 2019 for approval. 4. The Falmouth Rod & Gun Club, Inc. and the Town of Mashpee signed a 30-year lease agreement on the 24.7-acre Garner Bog parcel which is the northern most part of this conservation project. 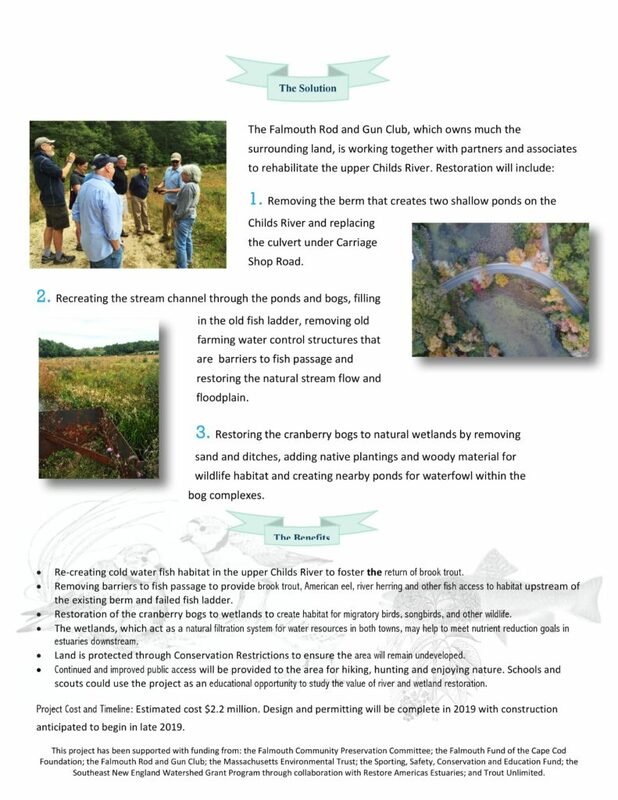 This long-term lease sets forth the terms and conditions under which the Rod & Gun Club will complete the Upper Childs River Restoration Project within the boundaries of the Town of Mashpee. 5. 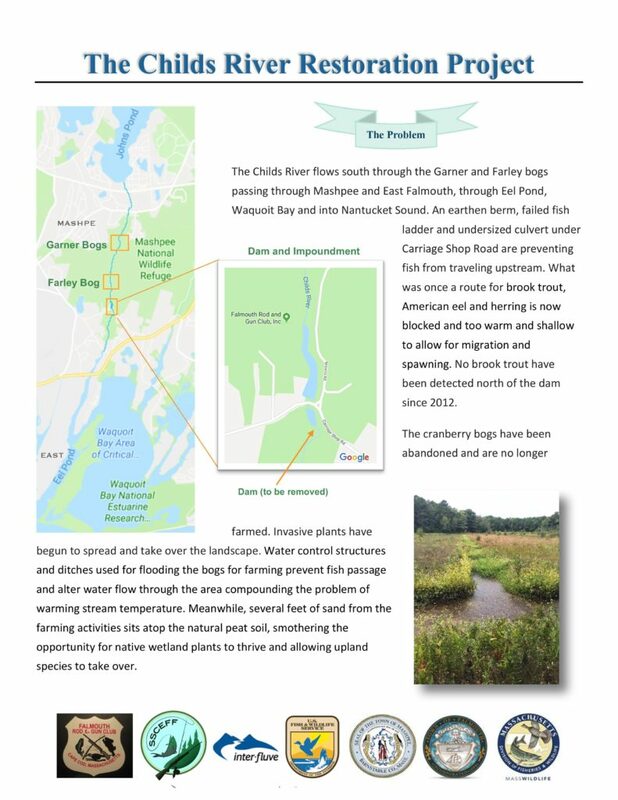 On December 6, 2018, Governor Baker’s office issued a press release announcing that our Childs River Restoration Project has been designated a “Priority Project” by the MA Division of Ecological Restoration (DER). This makes our project eligible for technical support, permitting help, project management and grants. DER is reviewing a possible grant for $30,000 for our project for the current fiscal year. 6. The project team, our engineer Inter-Fluve, APCC, US Fish & Wildlife Services (USF&WS), Falmouth DPW management, DPW’s engineer Tighe & Bond, WBNERR, and the MA Fisheries biologist met to discuss our engineer’s 60% Design Plan. Some of the group’s comments and suggestions will be incorporated into the 60% plan. 7. The project team and the USF&WS facilitated negotiations between the town and the federal government to fund replacement of the failing culvert under Carriage Shop Road. In December, the Falmouth DPW and the US Highway Administration (USHA), signed a Memorandum of Understanding whereby the Town and the USHA agree to partner to replace the culvert. USHA will provide $350,000 toward its construction, and the Town will provide funding for Tighe & Bond to do the engineering and permitting on the culvert. 8. The project team has obtained a list of abutters to the project area. This list will be used to inform any contiguous property owner of the project as part of the permitting process. 9. The project team has begun census of downed trees and root wads on the Rod & Gun Club’s property to be used to created habitat in the river. Using trees from our property can reduce construction costs as such trees would not have to be transported from off site. 10. Trout Unlimited has donated temperature and dissolved oxygen sensors. 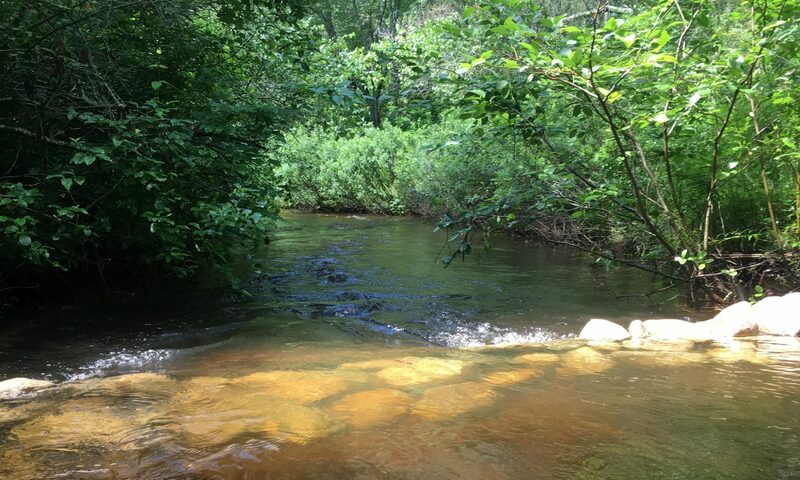 The project team, after conversations with Steve Hurley of MA Fisheries, strategically placed them in the river from the Garner Bogs in Mashpee to south of Carriage Shop Road in Falmouth. These sensors will provide valuable data to help identify the best locations for fish habitat based on water temperature, flow and oxygen measures. 11. The project team has placed several 360-degree picture posts on the property to record the progress of the project over time. 12. The project team has created a narrated video shot from a drone which shows the entire project area from about 100 feet above ground. The drone will be used to take videos during different seasons and to monitor the progress of the project. 13. With the 60% Design Plan in place, Inter-Fluve has begun contacting permitting agencies to begin that long process.